A couple of weeks ago during a dinner with friends, we started discussing the idea that less is more. It has become popular among our peers and society in general that we ALWAYS need to strive for less. It seems that everyone has been throwing this concept around us a lot – sometimes wildly and not really understanding how to accomplish it. 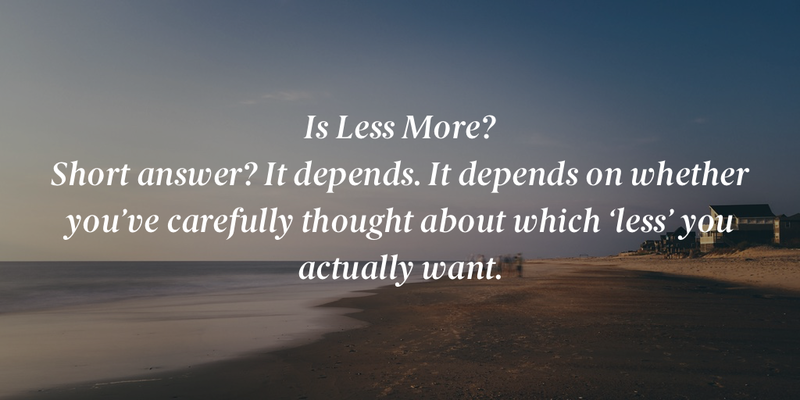 A Google search for ‘less is more’ serves you with more than 22 million hits and it’s often a quote by Ludwig Mies van der Rohe* used as a precept for minimalist design and architecture. But is Less really More? Short answer? It depends. It depends on whether you’ve carefully thought about which ‘less’ you actually want. It depends on what you are willing to sacrifice. It depends on what best serves your audience. This is time consuming and exhausting and most of us simply don’t put in the hours needed to define what ‘less’ we really want. So we just opt for ‘more’. After all, ‘more is more’ gives you more than 12 million Google hits. Could you have the wrong ‘less’? In France there’s a famous restaurant chain called le Relais de l’Entrecote that serves only one dish – you guessed it, entrecote. They’ve absolutely mastered everything about making it. Every night, they have people queuing up in long lines before they even open! Now compare this to a all-you-can-eat buffet with chicken wings, salad, vegetables, and meats in all sizes and cuts (including entrecote). Because they have chosen to serve everything – their entrecote is nowhere near as good as le Relais de l’Entrecote’s. This ‘okay’ entrecote is fine for most cases, but if you want a really great entrecote, you go somewhere they focus on it. At le Relais de l’Entrecote’s, less is more and profitably so. This same principle applies to your products. The better you can define your product, the better chance your core audience has of falling in love with it. Your product’s ‘less’ is what people will rave about. They don’t want a buffet. So, as product owner, what ‘less’ is it that you want to offer? As a user – whether it’s a TV show, travel, apps, or food – what ‘less’ do you want? Answering these questions begins the process of defining the experience you and your users want to have. Who knows? Understanding what really makes you appreciate things may just lead to a fuller life. PS. The fact that this post has similarities to my post Be the Butcher, not the Supermarket is a pure coincidence along with the fact that they both share food analogies – perhaps stop writing blog posts just before lunchtime 🥙🍴🤔?